Most of us trekkers don’t bother too much about the negative impacts we have on the environment and local economy while trekking in a particular area. Do we care much if our support staff is from outside rather than employing locals, or if porters chop down wood for fuel, or if we defecate anywhere we please. In most cases trekking agencies are the worst culprits hiring their entire support of non locals who don’t care much about the environment. If we wish to save the fragile mountain environment for others to enjoy we will need to change our approach to reduce the negative impacts of trekking. One way to reduce this negative trend is to empower and educate local communities, making them the key stake holders. TMI, the NGO I have been volunteering for has been doing a very good job in this area. IFS officer Dr Sandeep Tambe who was deputed to TMI as a project manager had been instrumental in eliminating grazing from most places in the Kangchendzonga National Park. Unsustainable grazing practices were having a very adverse effect on the fragile ecology of the park, destroying much of the habitat. To compensate the local communities for the loss of income TMI initiated community based treks/tourism in few of the remote villages, by forming local eco-tourism committees. After a few years of relationship building coupled with oodles of patience and tons of hard work, this initiative by TMI has seen the light of success. In this I found an ideal opportunity to contribute to the people of the mountains, assisting them in their efforts to conserve their vanishing customs and environment. Thus I planned my trip to few of the villages in West Sikkim to interact firsthand with the locals. My failure to take the only taxi leaving for Geyzing in the early hours of morning, proved to be a very expensive affair. Changing three jeeps, waiting endlessly in Ravangla market for a connecting jeep, crossing over a landslide at Legship, missing the final jeep from Darap, walking the final four kilometers to Nambu, was the price I had to pay. At long last reached my destination, Nambu, in the fading light of day. I was greeted very warmly by G.D Subba, my host with whom I had a very long conversation about the local community. Soon we were joined by Bimal, the treasurer of the Yambong ecotourism society who gave me a background of the committee. TMI had worked together with the villagers to make a trekking route, establish camps and build capacity of locals as cooks and guides. To support the marginally poor they made it mandatory for all trekking parties to hire porters and mules from these three villages only. A small percentage of porter, mule, cook, guide charges are retained by the committee as a plough back to maintain the trail, do clean up drives and upgrade infrastructure at the camps. The model seems to be very effective producing good results, which was visible from the statistics that Bimal had. Tired and famished from my adventures, requested for an early dinner, which consisted of a lavish spread on which I feasted. Early next morning I had visit from Lakhu, the president of the society who was to accompany me to Sanghkhola. Contrary to my expectations it was a sunny morning with clear skies, making our walk a pleasant one. 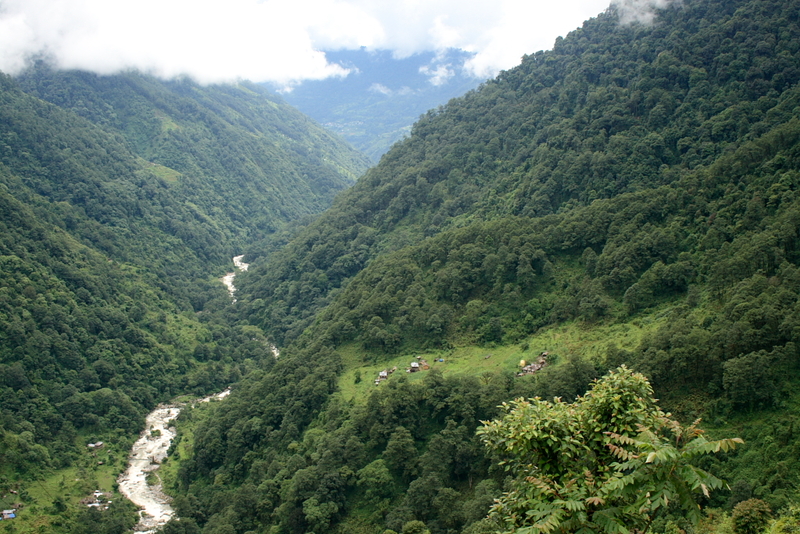 The first thirty minutes of our trek were knee wobbling steep as the route descended to the banks of the Rimbik River. From there it skirted the banks of the river, across some fields. Within an hours time we reached the Rimbik village, where under the shade of a mighty oak we took a short break. Lakhu was a great companion, modest, cheerful, soft spoken, holding on to interesting conversation. From Rimbik we traversed a bit further into the valley before hitting the main climb which really wasn’t all that steep. 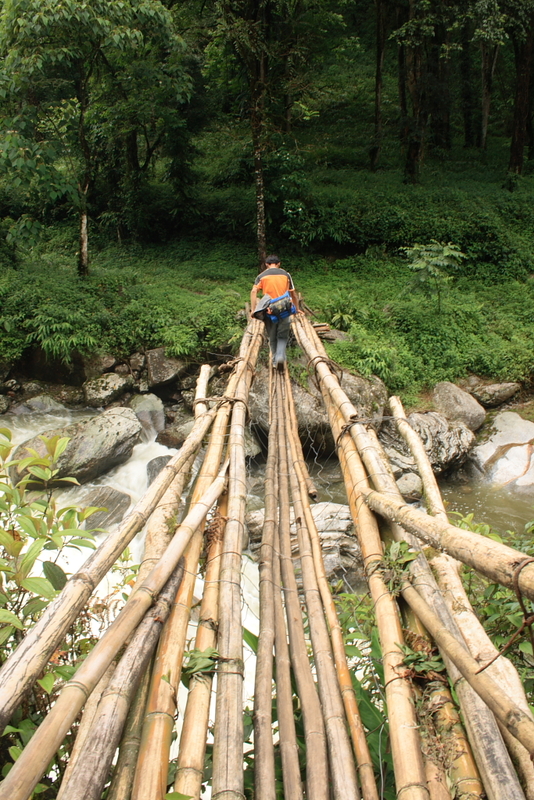 Negotiating the final and trickiest bamboo bridge got us to Sanghkhola in the midday sun. Lakhu took me to Nima’ sister’ house, where I was going to stay for the night. It was a very pretty place overlooking the river, with views of the verdant valley on both sides. It felt amazingly relaxing to be sipping on a hot cup of tea listening to the gently roar of the river. By late afternoon the weather had turned upside down as rain clouds engulfed the valley accompanied by light showers. Despite a turn in the weather we decided to go to Chongri village, the remote last village in West Sikkim. But within five minutes of our walk the rains lashed down with full fury forcing us to take shelter in a house. Thirty minutes of waiting brought us no luck of any kind so we called off our trip, deciding to try our luck the next morning instead. Once the rain showed some signs of abating we left our shelter to walk around the village. Lakhu showed me the local primary school. The rest of the evening was spent reading and chatting away with Lakhu and my hosts’ family. The clear skies indicated a promise of a fine morning. By nine Lakhu and myself were on our way to Chongri, climbing the steep slopes. The two hour climb passed through perennially forested slopes, enlivened by the chirping of the birds. Was completely captivated by the rich hues of the Fairy Bluebird of which we saw quite a few. Towards the end of the climb got stupendous views of the valley below, stretching out for many miles. At Chongri, Lakhu showed me the trekker’ hut, a basic clean one, which had been built from the money they had accumulated. Spent some time meeting the panchayat, went to meet Nima’ parents and left back for Sangkhola. On Lakhu’ insistence had my lunch before I left for my return to Nambu. The going was quick and easy, but that was only till I reached my final climb from the river bank to Nambu. The climb proved to be quite a killer with its steep continuous gradient. Half way through my thighs were shouting, heart thumping, with runnels of sweat running down my forehead. Every time I looked up I could only see more steps; in what seemed to be a never ending game of snakes and ladders. With wobbling legs I did finally manage to reach G.D. Subba’ house where I stayed the night over. The jeep to Yuksom came to Darap around one in the afternoon so I had plenty of time to while away the next morning. Had a late breakfast or early lunch, whatever you choose to call, for by this time I had got used to the fact that in this land every meal consisted of rice, dal and vegetables which was given a different name depending on the time of the day you ate. At around midday began my march to Nambu which turned pretty entertaining three quarter way through. I was crossed by two guys on a motorbike who halted seeing me walking with a backpack. The two Biharis were pretty amazed to see a crazy guy from Mumbai walking alone in this part of Sikkim. For twenty minutes they talked non stop about their experience in Sikkim giving me all sorts of tips and advice, while I nodded my head. In all their friendship they offered to give me a lift till Darap, to which I politely refused. That was not acceptable to them, so after five minutes of coaxing me I finally gave into them. Very anxiously I tried to balance myself as the bike picked up speed, swinging like a balancing scale which had gone haywire. Then came the terrifying movement of crossing a large stream where I was pretty sure we would fall, but by God’ mercy we somehow managed to clear it. With a great sigh of relief I bid my two over friendly companions goodbye as they dropped me to Darap in one piece. The reason for my overnight stay to Yuksom was to meet up with Kinzong. Kinzong is one of those few people from the younger generation in Sikkim, who is taking a leading role in environmental conservation as a long term benefit to the local communities. Being a local from Yuksom he has taken many initiatives to conserve the degrading environment along the Yuksom –Dzongri trail, by educating the local communities as also by getting certain rules enforced for trekkers. He has played an active role in KCC (Kangchendzonga Conservation Committee) which is doing a good job of improving the livelihood of the local communities while protecting the environment. Besides Kinzong is an excellent trekking guide having a good deal of experience organizing and guiding treks in the Dzongri region. I wanted to understand the finer nuances of the business, as also clear the myriad haze of permits involved. Yuksom looked very different in the light mist and rain, than what I had seen it the previous October. It bore a very desolate look, albeit one which was extremely peaceful and serene. Had the terrific aloo paratha at Gupta’ restaurant for lunch, to my surprise he recognized me even through my thick beard. We spoke for quite some time while I awaited for Kinzong to pick me up. Spoke to Kinzong the entire evening, our conversation ranging from environmental conservation, community development to the political situation in Sikkim. Got lots of inputs from him regarding organizing treks, about how the Yambong committee could be helped with their endeavor, some of his work in Arunachal with WWF. So absorbed were we that it was nearly midnight before we ended our wonderful conversation. Early next morning left for Gantok, bringing to an end a momentous two and a half month stay in Sikkim.